Central scenario (70% probability): global growth slows gradually but surely. Growth is slowing worldwide: Since this summer economic trends have diverged. Growth has weakened in the Eurozone but remains solid in the US. Confidence remains high in spite of rising risks. Emerging economies have been hit by the financial spillover from Argentina and Turkey. The broad-based appreciation of the USD has undermined dollar-indebted economies, leading to capital outflows from emerging economies and a depreciation of their currencies, which has, in turn, stoked inflation. All in all, central banks have begun to move their monetary policies to a more hawkish stance in many EM countries simultaneously. Lastly, the economic slowdown has been more pronounced than expected in China, which has led the authorities to shift course in economic policy. World trade: Global trade has weakened slightly since the start of the year. The tariff hikes announced by Donald Trump on steel and aluminium were finally implemented on June 1 on Canada, Mexico and the EU. Protectionist rhetoric has pushed down business confidence, particularly in Europe. However, keep in mind that the products targeted so far account for a small share of world trade and that retaliations from trading partners have been moderate. That said, uncertainty is tending to disrupt value chains that have developed in lock-step with the expansion in global trade over the past 15 years. In light of the above, we continue to expect the global trade to global GDP ratio to decline, with growth in trade lagging slightly behind global GDP. United States: Unsurprisingly, 3%-plus growth is being forecast in Q3 2018, and the US economy continues to create jobs. The job market is becoming tighter and wages are beginning to accelerate. Surveys continue to point to above-potential growth in the coming quarters. Monetary and financial conditions remain accommodative despite Fed rate hikes and the dollar’s appreciation. Fiscal stimulus, including tax cuts and higher spending, is what is driving the economy at this point in the cycle. A recession is highly unlikely in 2019, but the cycle-end story will probably return to the fore at some point by next summer, as the fiscal multiplier impact fades and as the effects of monetary tightening show up. We forecast a slowdown in growth by 2020, with GDP growth closer to 2% by then. Eurozone: We have revised our growth forecasts slightly downward, to 2.0% for 2018 and to 1.8% for 2019. Protectionism has undermined confidence, but the latest surveys suggest that the Eurozone is holding up well. 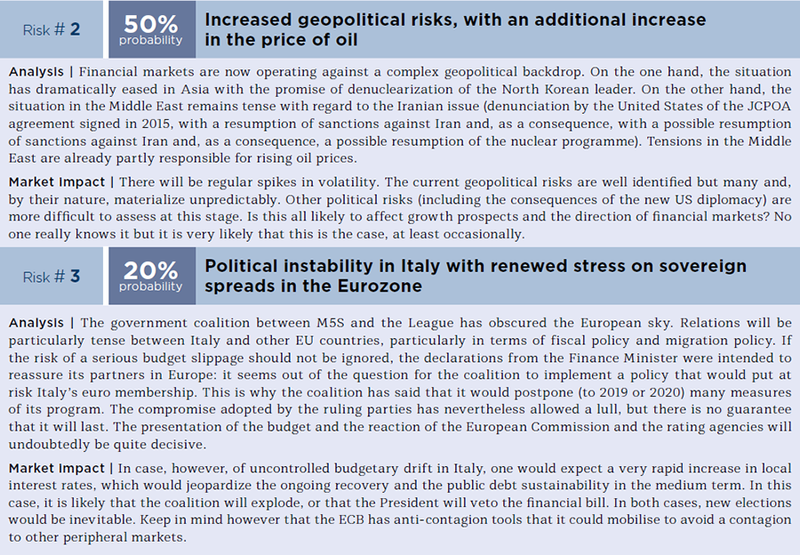 At this stage, we do not expect the new governing coalition in Italy to have a significant impact on the economy (see the “theme of the month” in this edition). Barring an exogenous shock, peripheral economies will remain in catch-up mode, especially as the ECB plans to stick to its ultra-accommodative stance, despite ending its securities purchase programme by the end of 2018. On the political front, illegal migration remains the main issue and is likely to keep tensions high in the run-up to May 2019 European elections. In Germany, elections in Bavaria on 14 October will serve as a test. United Kingdom: Brexit negotiations have bogged down, and the deadline for reaching an agreement with the EU this year probably won’t be met. There are wide dissensions in the UK on Brexit procedures, particularly on whether or not to remain in the customs union. The EU, meanwhile, wants to demonstrate that an exit is not in any country’s interest. All in all, we do expect an agreement, but no doubt not until 2019, which will give the UK a transition period until December 2020. We expect this to weigh on growth for as long as the uncertainty persists. China: The Chinese economy is slowing, due, in part, to the weakening in global growth. Trade tensions with the US continue to grab headlines. The US threat to impose €200bn in tariffs on Chinese goods is taken very seriously by the Chinese government. It is against this backdrop that China has just shifted its economic policy in favour of a pro-growth fiscal policy. We have lowered very slightly (by 0.1pp) our forecast for next year. Even so, the risks to growth now look to be clearly on the downside. Inflation: Core inflation remains low at this stage of the cycle, especially in advanced economies, and should recover gradually. That said, the slowdown in inflation in recent years is primarily structural in nature, as it is tied to supply-side factors, while the cyclical component of inflation has weakened (with a flattening of the Phillips curve). Core inflation is likely to pick up only slightly in advanced economies. An “inflationary surprise” remains possible but would not last long amidst a slackening in global growth. Things are different in emerging economies, where inflationary pressuresannounced by Trump weigh on confidence, especially in Europe. And Donald Trump is ready to go further (he explicitly threatens to raise tariffs on imported cars from Europe from 2.5% to 20%). This threat is to be taken very seriously. The likelihood of a tougher trade confrontation is increasing, at a time when geopolitical risks in the Middle East remain elevated (with upside risks on oil). Oil prices: Oil prices have increased sharply ($77/bbl. for Brent) to an almost four-year high, due to tensions in the Middle East, OPEC policy, and still-strong global demand. Short-term risks are on the upside. Rebalancing by boosting supply will take time, with US production already at a historic high. Our equilibrium-price assumption (around $75) is our forecast on a 6-to-12-month horizon. Central banks will continue to remove monetary accommodation at a gradual pace. The Fed will continue to raise its key interest rates. We expect the Fed to follow through with two 25bp hikes in H2 2018 (in September and December) and two additional hikes in H1 2019, followed by a pause, and for it to reduce its balance sheet at the announced pace (with a gradual non-replacement of maturing securities. Meanwhile, the ECB will reduce its monthly asset purchases from €30bn to €15bn in Q4 and end its APP in December. Its first rate hike is not expected until Q3 or Q4 2019. The protectionist measures announced by Trump have ratcheted up uncertainty worldwide and have probably fed the appreciation in the dollar and capital outflows from emerging economies, which are quite vulnerable to international trade issues. Trump now says he is ready to go further. This threat should be taken very seriously by both China and Europe. A more serious confrontation on trade is likely while at the same time geopolitical risks are predominant in the Middle East, with a risk to oil prices. Downside risk scenario (25% probability): a marked trade-war-driven economic slowdown, a geopolitical crisis or a sudden repricing of risk premiums. The risk of heavier protectionist measures (from the US) followed by retaliations from the rest of the world rises as the 6 November mid-term elections draw near (as Trump seeks to satisfy his electoral base). China, the EU and Canada are particularly exposed to this risk. Aggravation of current geopolitical tensions in the Middle East. All things being equal, a trade war would be bad news for growth and, in the short term, could prove inflationary. That said, a global trade war would quickly become deflationary by creating a shock to global demand. An abrupt repricing of risk on fixed income markets, with an across-the-board rise in spreads on govies and credit, on both developed and emerging markets, and a decline in market liquidity. 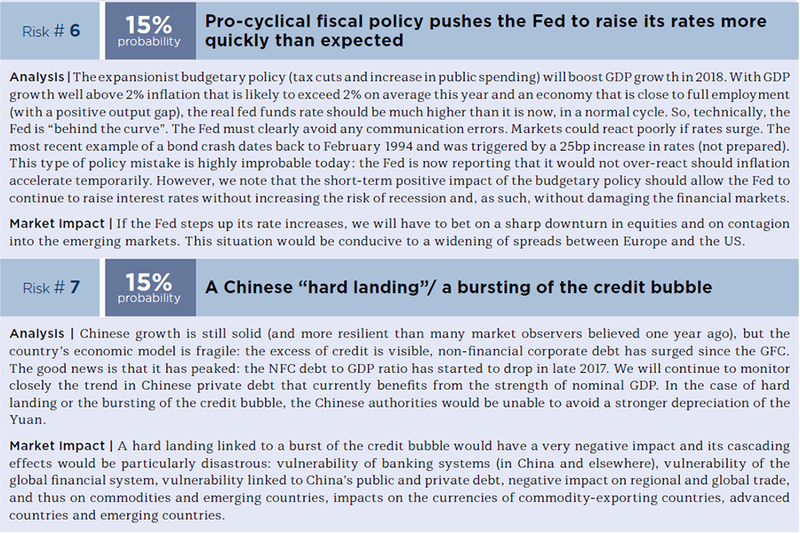 Amidst the resulting financial turbulence, the cycle-end story would resurface in the US. Central banks would cease recalibrating their monetary policies and, in the worst, albeit highly unlikely, case, would once again resort to unconventional tools, such as expanding their balance sheets. 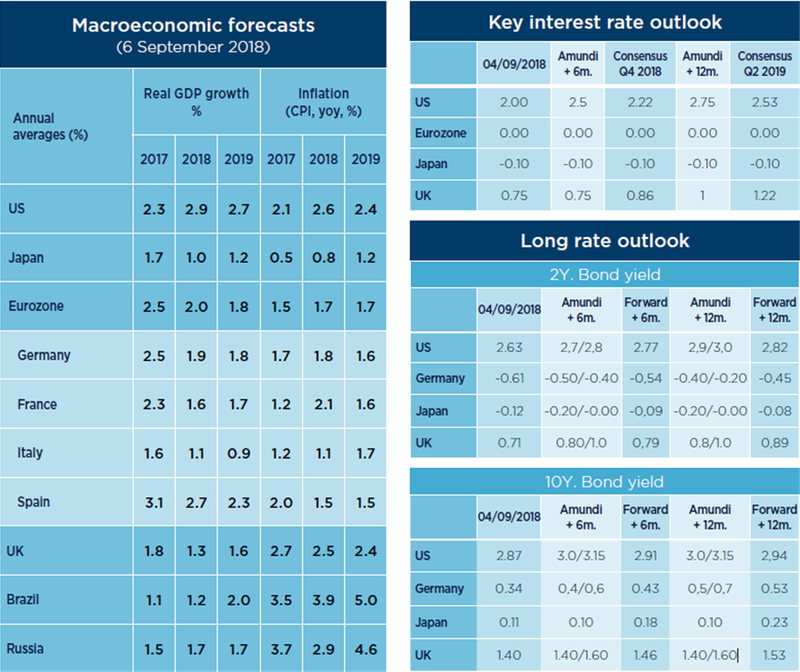 Note that there is now very little likelihood of the upside risk coming to pass, due to the uncertainties surrounding trade tensions between the US, China Europe, in particular against a backdrop of geopolitical risks (Iran), a recession in several major emerging markets (including Turkey and Argentina), political risk in Brazil, a Chinese slowdown, and political tensions in Europe (tensions between Italy and the EU, Brexit). 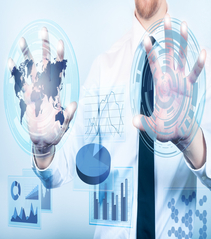 All these factors are making companies more cautious. Acceleration driven by business investment and global growth if protectionist tensions fade. Pro-cyclical US fiscal policy generating a greater-than-expected acceleration in domestic growth. Growth is reaccelerating in the Eurozone after a dip in H1. Stabilisation in China. Central banks would react late in initially maintaining ultra-accommodative monetary conditions. Business sentiment remained strong and surveys further highlighted capex expansion plans. Consumers remained upbeat thanks to rising wages and a strong labor market. Industrial activity trended higher, supported by resilient demand. Core measures of capital goods orders confirmed their strength while retail sales offered strong readings. On a slightly disappointing note, the productivity trend remained modest with various metrics signaling a deceleration in the housing sector. The inflation outlook continues to stay aligned with Fed projections, with modest domestic inflationary pressure and PCE measures converging with Fed objectives. Rates remained unchanged after the August FOMC meeting (1.75% to 2.00%). With monetary policy accommodation gradually coming to an end the policy stance should soon relabeled as neutral. 25% tariffs against China were implemented (on $16bn, after $34bn in July) with more to come ($200bn). NAFTA: a preliminary Mexico-US agreement was reached. After numerous disappointments at the beginning of the year (GDP only rose by 0.8% in H1), economic indicators stabilised over the summer, in line with GDP growth of around 2% per year. Underlying inflation remains stuck at around 1% per year, even though wage increases are expected to enable it to increase slightly in the coming months. The future attitude of the new Italian government, whose budget promises are incompatible with European regulations, remains a factor of uncertainty. Moreover, the Eurozone is more exposed than the United States to the trade war risk. Growth rebounded in Q2 (+0.4%), confirming that the weak Q1 figure (+0.2%) underestimated the real trend. The labour market remains in good shape and real wages returned to positive territory. However, the uncertainty surrounding Brexit is dragging down confidence and investment. There are still major differences between the negotiating parties standing in the way of an agreement over withdrawal from the EU, and time is running out. The likelihood of a hard Brexit seems to be increasing. The economy bounced back from its Q1 setback driven by a sharp rebound in household spending and continuously vigorous business investments. However, earthquakes in June followed by heavy downpours and a fierce heatwave in July and August put a halt to factory operations and commercial activities. The economy should regain strength in autumn as producers accelerate outputs in order to recoup their losses. Corporate Japan plans to expand capital expenditures at the highest pace since 2006 despite trade dispute fears. In the meanwhile, monthly wages scored their largest y/y gain in July with the labour market hitting a 44-year high. Minimum wages are to be raised in October, while more labour-substitution purpose investments are in the pipeline. The policy stance has turned around meaningfully in response to greater near-term risks. The economy is cooling off, with credit growth slowing more than expected, as a result of deleveraging. US/China trade tensions have ratcheted up, with tariffs on $50bn products implemented on each other, while Trump may impose tariffs in September on an additional $200bn of China’s goods. In response, China has shifted its policy stance more meaningfully, through monetary, fiscal and deleveraging measures, and looks more determined to push further reforms and openings. Policymakers also took several measures to stabilise the RMB to prevent systematic risks, although greater FX flexibility is being allowed. Uncertainty likely to remain relatively high. Keep an eye on further US trade measures and on whether policy supports can help achieve a soft landing of China’s economy. Economic growth remained resilient with macro momentum stabilising. Looking at the countries that have reported their GDP growth for Q2 2018, it’s worth highlighting that domestic demand (Households Consumptions and Fixed Investments) performed better than Net Exports. In the first half Inflation data was very benign. Oil price spikes and currency weaknesses didn’t impact CPI significantly. As expected India’s inflation declined towards 4% (pivot level in the CB target range) while inflation in the Philippines kept increasing above the CB target. Monetary Policies confirmed their hawkish stance. Most recent actions include an expected 25bp hike by the RBI, a bold 50bp hike by the BSP and an unexpected 25bp hike by the BI. Indonesia released its fiscal plan for 2019, with healthy fiscal accounts in 2018 so far and the will to continue on the road of fiscal responsibility. Stable and still constructive macroeconomic momentum. Inflation still very benign with few exceptions. Latin American countries reported resilient economic figures (stronger GDP figures in Mexico, Chile and Peru) with Brazil’s macroeconomic momentum lately improving too (Industrial Production stood at 3.5% YoY in June up from -6.6% in May). On the inflation side, although the overall environment remained benign, Mexico’s inflation decline was interrupted in July, with CPI rising to 4.8% up from 4.6% in June; while Brazil’s inflation increased temporarily, due to the May strike, to around 4.5% in June/July up from approx. 3% in May. The region’s main Central Banks remained on hold in their recent Monetary Policy meetings with Banxico keeping a tighter stance due to an inflation rate struggling to converge to the target. As expected, AMLO (Morena Party) won the Mexican elections. In Brazil the political situation remains quite fluid as the October Presidential elections approach. Resilient economic figures with Brazil lately improving. Inflation higher in Mexico and Brazil. Busy political agenda continues, next elections in Brazil on 7 October. Despite the threat of potential US sanctions down the road, the macroeconomic scenario remains supportive helped by high oil prices. Russia will among the few emerging market sovereigns with the “twin surpluses” in 2018, while accumulating assets at the National Wealth Fund. With sizeable current account deficit financed by portfolio inflows (not FDI) and inadequate external liquidity, SA remains vulnerable to EM turmoil. These risk are supplemented by vulnerabilities from the fiscal side and contingent liabilities from SOEs. Turkey: we downgrade forecast a slowdown in growth in 2018 to 1.8%. The TRY has dived given large external imbalances, poor external liquidity and nonorthodox policies of the government. Investors have lost faith in Turkish assets, while the central bank - a policy instrument of the government --has been unable to hike rates. Turkish corporates have begun to default. This will impact the health of the heavily indebted (in foreign currency) and very large banking sector very negatively. Inaction by the CBRT, continued market turmoil, and further drop GDP and in asset prices.